Willie wrote this song on Christmas, 2003, and performed it for the first time at the Dennis Kucinich for President fundraising concert in Austin, Texas, on Jan. 3, 2004. Willie Nelson performed at the DAR Constitution Hall, on November 18th, after he was presented with the Library of Congress Gershwin Award. He performed “Promiseland”. “I think this is one of the most appropriate songs that we could do for this period in America,” Willie Nelson told the crowd after being awarded the The Library of Congress’ Gershwin Prize for Popular Song. “Many years ago, I recorded this song and I felt like this might be a good time to kind of try to bring it back. Willie Nelson sang this song on Wednesday, after he was presented with the Gershwin Prize for Popular Song by the Library of Congress, in Washington DC. “Living in the Promiseland” is track #37 on the album The Essential Willie Nelson. It was written by Paul Madeira; Jimmy Dorsey. I was at a concert this weekend in California to raise money for the National Veterans Foundation. I’m an Air Force veteran, and I have great respect for the military. I like to support the soldiers whenever I can. But I don’t support this war in Iraq. I was against the war before it started. I always thought it was a terrible decision, badly thought out, badly planned, and then horribly executed. I want to see our troops come home right away, and so do most Americans. Unfortunately, too many politicians in both parties refuse to listen. So when will the troops come home? When we won’t put up with it anymore–when we change our government. And how will we do that? By voting the bastards out! On November 7th, you should vote for anyone who’s against the war and vote against anyone who’s for the war. It’s that simple. When I wrote the song “Whatever Happened to Peace on Earth” (LYRICS) at Christmastime in 2003, a lot of people were for the war, a lot of people didn’t know the facts or the truth. But people are waking up now. They’re learning that they were lied to about the war. They’re feeling lied to about this Mark Foley scandal in terms of who knew what and when. They’re questioning the leadership in this country. And that gives us new possibilities for November 7th. If we all go out and vote for peace candidates and get our friends to vote, and if our votes are really counted, it’s no contest. There’ll be a change in the Congress, and then we’ll just have to keep building so we can get a president who won’t send our soldiers to fight a war based on lies. We should have thrown the bastards out years ago. Let’s do it now! 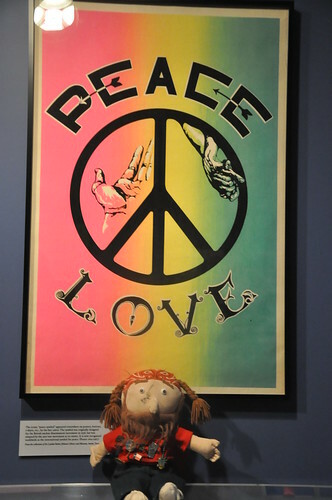 Give Peace A VOTE! Congressman Dennis Kucinich with Willie Nelson. Come and visit www.kucinich.us Video done by Chad Ely. Willie sang this song at a fundraiser for Dennis Kucinich in Austin, Texas, in January 2004. Willie wrote this song on Christmas, 2003, andÂ performed it for the first time at the Kucinich for President fundraising concert in Austin, Texas, on Jan. 3, 2004. Willie Nelson’s great-grandson Zack’s class sings “A Peaceful Solution.” Willie is later joined onstage by Zack to perform the song at The Backyard in Austin, Texas this past March. Thanks to Matt Hubbard and Rebecca Thomas, for putting this together and sharing it. Magical moments. 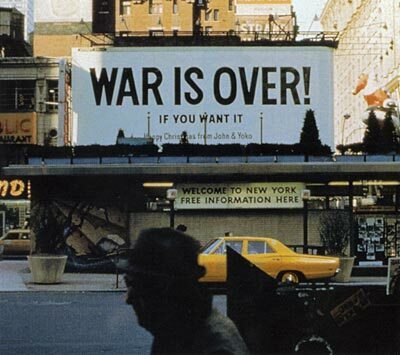 At Christmas in 1969 John Lennon and Yoko Ono rented billboards in 11 cities across the world with the simple message: War Is Over! 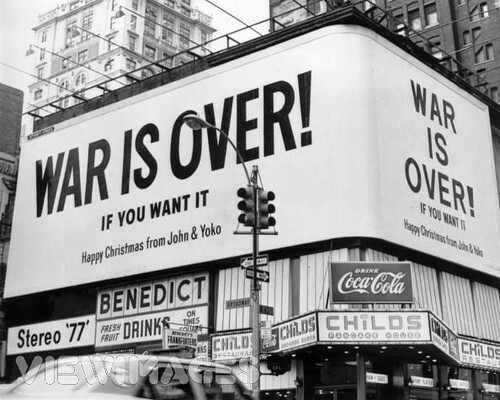 (If You Want It) Happy Christmas from John & Yoko. There is a Peaceful Solution! 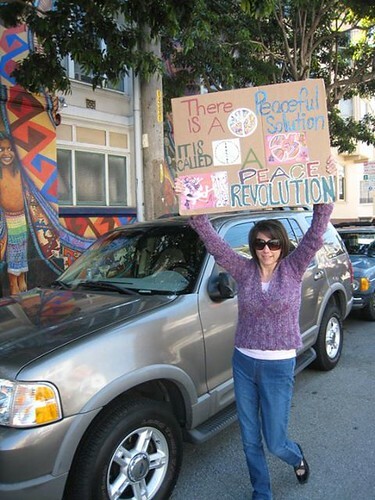 A Peaceful Revolution! The sweet music lover, activist and free spirit, Mary Jane Lane.